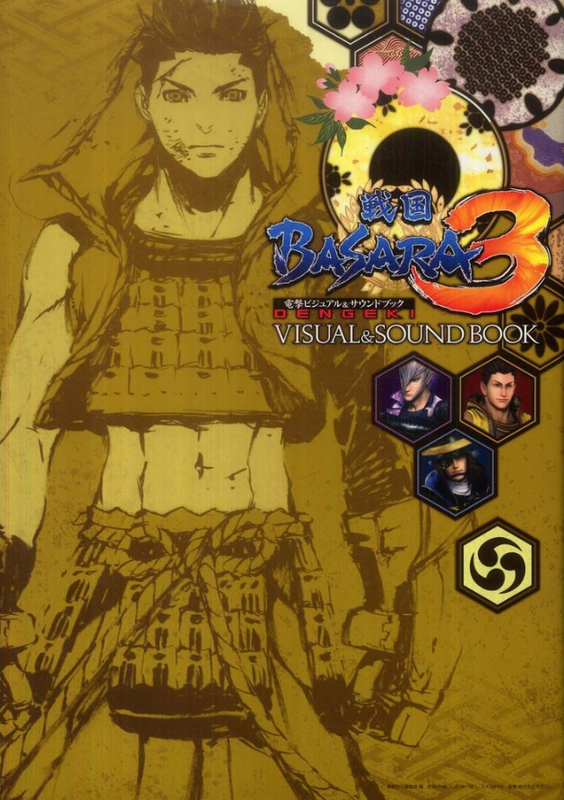 The Sengoku Basara 3 Dengeki Visual & Sound Book was the very last in the 'Visual & Sound Book' series. Published on 26th March 2011 by ASCII Media Works, it's still available from good Japanese bookstores such as Yesasia, CD Japan and Amazon Japan at the original price of ¥1,900 (¥1,995 with tax). There are a handful of small preview illustrations available on Capcom's website here. Sengoku Basara 3 Dengeki Visual & Sound Book is only 80 pages in length and comes with a special 31-minute audio CD. There's no continuity between this and the other four Visual & Sound Books so everything can be enjoyed even if you don't have the earlier volumes. The book opens with the usual 'Gravure of Heroes' with the theme 'VerSus Heroes', i.e. portraits showing pairs of characters together - usually mid-battle. Capcom brought in some of their very best Sengoku Basara illustrators to make this set of pictures particularly rewarding. Sumeragi is up first with a gorgeous drawing of Ieyasu and Mitsunari clashing the way they do in the Sengoku Basara 3 opening movie. It's hard to believe that the artist behind the cute Mini Sengoku Basara Two and Mame Sengoku Basara manga can also handle a cool fight scene using a more conventional art style. Next comes Wolfina with my favourite picture of the lot: Magoichi and Keiji relaxing surrounded by flowers. Keiji looks peaceful and Magoichi is stunningly beautiful. The mood suddenly changes on the following page with Yuupon's illustration of a funny surfing scene between Motochika and Tsuruhime; all the more precious since Tsuruhime has yet to receive an actual One Coin Grande figure in Yuupon's signature twirly-eyed art style. This picture proves that she'd look great if she ever gets the chance to appear in a new line of figures. Nagasawa Shin goes for an unusual pose to highlight the way that Mitsunari's openly furious expression contrasts with Yoshitsugu's menacing glare. It's a dark, threatening picture - unlike Hikaki's which has Sourin dancing in front of a large Xavi statue next to Muneshige in a battle-ready stance. Shishizaru's detailed, dynamic snapshot of a battle between 'Oni Shimazu' and Kanbee allows two lesser-seen characters a moment in the spotlight together. Katagiri Ikumi closes the chapter with a creepy study of an Oichi vs Tenkai battle rendered in stark shades of red and grey. The total number of votes was 32,012. Characters not on the list weren't included in the voting, so there are no weird results with NPCs beating popular warlords this time. It's a good thing they chose to reward the top five characters since the fight for second place was very close! The portraits were drawn by RURU (Masamune), Kazama Raita (Mitsunari), Rei (Yukimura), Kuori Chimaki (Motonari) and Sarachi Yomi (Motochika). 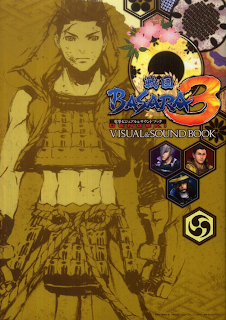 With all of the colour artwork out of the way, the book moves on to its main attraction, and this time the Visual & Sound Book presents a standalone 40-page manga titled Sengoku Basara 3 -Hajimari- ('Beginning') instead of lazily re-using existing content. The manga recounts an expanded version of the events from Ieyasu's opening cut scene in Sengoku Basara 3, starting with him killing Hideyoshi and ending after he makes a contract with the Saika Shuu. It's drawn by Katagiri Ikumi with supervision by the game's director and producer. As usual, the reader is supposed to play the CD alongside the manga to turn it into a fully voiced multimedia experience. Seiyuu Ookawa Tooru (Tokugawa Ieyasu), Seki Tomokazu (Ishida Mitsunari), Nakai Kazuya (Date Masamune), Oohara Sayaka (Saika Magoichi) and Okiayu Ryoutarou (Toyotomi Hideyoshi) join narrator Watanabe Hideo in performing the complete story. I noticed that the entire manga features furigana over all of the kanji, making it even easier for a student of Japanese to follow along with the CD. Katagiri's artwork is excellent, though for some reason there's very little tone used in this manga which makes a couple pages look very flat; I'm not sure whether this was necessary to meet the deadline or a deliberate stylistic decision. The story itself was interesting, showing Ieyasu interacting with his soldiers and adding a few extra lines of dialogue to his confrontation with Hideyoshi. If I was to make one criticism it would be that the scenes with Masamune felt forced and didn't contribute anything significant to the story, and in one panel Kojuurou has a line of dialogue which is simply skipped in the audio performance since his seiyuu doesn't appear. Surely it would have been better to use the Masamune scenes to delve deeper into Mitsunari's growing hatred towards Ieyasu (or just fill them with fight scenes)? Even though Masamune is popular - and indeed he's one of my favourite characters - it felt unnecessary to include him in a cameo role. The rest of the content on the CD is a 20-minute 'talk show' with Ookawa, Seki and Nakai, designed to accompany the final four pages of the book which are filled with reader contributions. The CD was put together a little strangely; Seki and Ookawa were clearly presenting the show but Nakai's lines seem to have been pre-recorded separately and inserted into the talk show for the pair to react to. The two hosts chatted and responded to a few bizarre questions posed by fans. The first asked them to read lines about their characters in the style of the famous 'tenkabito senryuu' used to describe the three great unifiers by the way they'd treat a silent cuckoo (more information here). The second compared various characters in the series to vegetables, and the final question asked who could shout their signature phrase for longest. Seki's blood-curdling 16-second "Ieyasuuu!" beat Ookawa's 11-second "Tadakatsuuu!" in the end. Overall, I enjoyed this final Visual & Sound Book much more than its immediate predecessor. There was more brand-new content and the new Sengoku Basara 3 characters added a splash of variety to the roster. I wonder if we'll see additional volumes printed in future to accompany Sengoku Basara 4?